The purpose of this research was to investigate the influence of the Javanese gamelan pieces, namely gendhing lancaran towards the increasing of the spatial-temporal ability. The subjects of this research consist of 60 elementary school students in the fourth grade. By using random methods, those subjects are grouped into two groups those are 30 students on the experiment group and 30 others on the control group. The subjects were assigned to one of two conditions: listening gendhing lancaran (for the experiment group) or no music (for the control group). As a spatial-temporal task, CFIT (culture fair intelligence test) was administered before and after listening gendhing lancaran. The experiment group is scored significantly higher than the non-music group on CFIT. These data support this research as the elements of sounds produced by various music instruments can give stimulus or influence spatial-temporal ability. Tujuan penelitian ini adalah menginvestigasi pengaruh tetembangan gamelan Jawa, yaitu gendhing lancaran terhadap peningkatan kemampuan spasial-temporal. Subjek penelitian ini adalah 60 murid sekolah dasar di kelas empat. Dengan menggunakan metode acak, subjek-subjek tersebut dijadikan ke dalam dua kelompok, yaitu 30 dalam kelompok eksperimen dan 30 lainnya dalam kelompok pengawasan. Mereka dikaitkan dengan salah satu dari dua kondisi: mendengar gendhing lancaran (untuk kelompok eksperimen) atau tidak mendengar musik tersebut (untuk kelompok pengawasan). Sebagai tugas spasial-temporal, CFIT (culture fair intelligence test) dicatat sebelum dan sesudah mendengar gendhing lancaran. Kelompok eksperimen secara signifikan bernilai lebih tinggi dibandingkan kelompok pengawasan melalui CFIT. Data ini mendukung penelitian ini di mana elemen-elemen bunyi yang dihasilkan berbagai alat musik dapat memberikan stimulus atau pengaruh pada kemampuan spasial-temporal. Arnheim, R. 1969, Visual Thinking, University of California Press, Berkeley. Bennet, D., and A. Bennet. 2008. “Engaging Tacit Knowledge in Support of Organizational Learning”. VINE 38 (1): 72–94. Bhattacharya, J; Petsche, H; Feldmann, U; Rescher, B. 2001. “EEG Gamma Band Phase Synchronization between Posterior and Frontal Cortex during Mental Rotation in Humans”, Neuroscience Letters, 311, 29-32. Black, Julia Schnebly; Moore, Stephen F. 1997. The Rhythm Inside, Rudra Press, Portland, Pregon. Friedman, H. R; Davachi, L; Rakic P. S. G. 1997. “Differential Activation of the Caudate Nucleus in Primates Performing Spatial and Nonspatial Working Memory Tasks”. The Journal of Neuroscience, 17 (10), 3870-3882. Gromko, J; Poorman A. 1998. 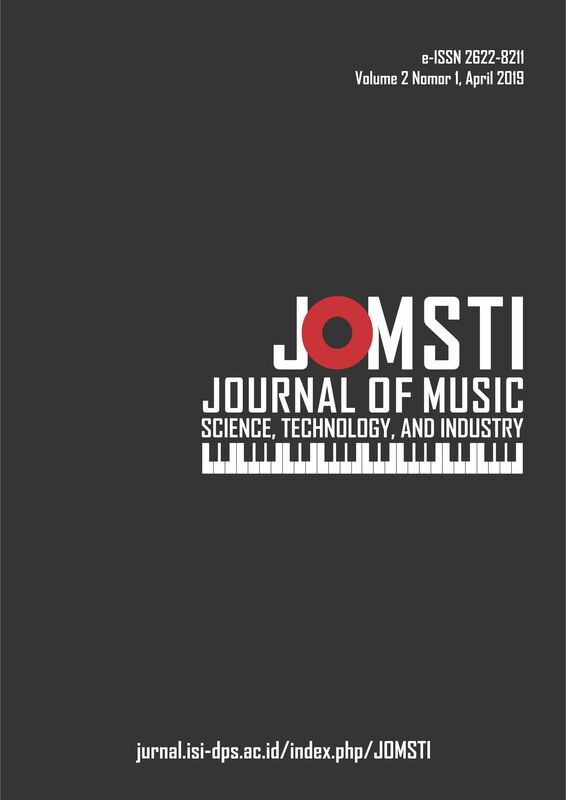 The effect of music training on preschoolers’ spatial–temporal task performance, Journal of Research on Music Education, 46(2), 173–181. Hetland, L. 2000, “Listening to Music Enhances Spatial-Temporal Reasoning: Evidence for The “Mozart Effect”, Journal of Aesthetic Education 34, 105-48. Jensen. 2000. Brain-Based Learning, Corwin Press, Thousand Oaks, CA. Leng, X; Shaw, G. L. 1991. “Towards A Neural Theory of Higher Brain Function Using Music As A Window”. Concepts in Neuroscience, 2, 229-258. Mallory, M. E; Philbrick, K. E. 1995. “Music Training and Spatial Skills in Preschool Children”. Paper presented at the America Psychological Association of Music, New York. Rauscher, F. H; Shaw, G. L; Levine, L. J; Wright, E. L; Dennis, W. R; Newcomb, R. L. 1997. “Music Training Causes Long-Term Enhancement of Preschool Children’s Spatial-Temporal Reasoning”. Neurological Research, 19(1), 1-8. Rauscher, F.H; Shaw, G.L; Ky, K.N. 1993. “Music and Spatial Task Performance”. Nature, 365, 611. Rauscher; Hinton. 2006. “The Mozart Effect: Music Listening is not Music Instruction”, Educational Psychologist, 41, 233-238. Rauscher, F. H; Zupan, Mary Anne. 2000. “Classroom Keyboard Instruction Improves Kindergarten Children’s Spatial-Temporal Performance: A Field Experiment”, Early Childhood Research Quarterly, 15 (2), 215-228. Russeler, J; Alten Muller, E; Nager, W; Kohlmetz, C; Munte, T. 2001. “Event Related Brain Potentials to Sound Omissions Differ in Musicians and Non-Musicians”, Neuroscience Letters, 308, 33–36. Satiadarma, M; Zahra, R. 2004. Cerdas Dengan Musik. Puspa Swara, Jakarta. Shawn G. L. 2001, “The Mozart Effect”, Epilepsy & Behavior, 2, 611-613. Supanggah, Rahayu. 2003. Bothekan I. ISI Surakarta Press. Supanggah, Rahayu. 2007. Bothekan II. ISI Surakarta Press. Tunks, T. W. 1992, Handbook of Research on Music Education Teaching and Learning, Schirmer Books, New York.